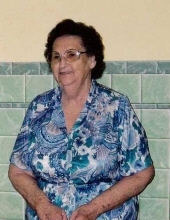 Mae Dean “Sade” (Sanders) Phillips, Clever, Missouri, departed this life for her Heavenly home after 96 years, 4 months and 24 days, on Sunday, March 24, 2019, in Sonshine Manor, Republic, Missouri. Sade was a lifelong resident of the Clever area who was known by many as being a strong willed, hard working individual, who loved her flowers and working with them. The youngest of five children, she was born to John and Addie (Gardner) Sanders, on October 30,1922, in Christian County, Missouri. Sade married her first husband Carl Pope in 1940; their marriage lasted two short weeks, due to Carl’s passing. She was then united in marriage to Earnest “Buck” Phillips on July 1, 1941 in Christian County, Missouri. To this union, they were blessed with three children; Sharon, Ronnie and Stevie. She is survived by daughter, Sharon (Glendale Hood) and son, Stevie “Lard” Phillips; sister in law, Jane Phillips; daughter in law, Charlene Phillips; eight grandchildren, Tracey (Berry Brown), Teri Shepard (Ed), Tim (Robin Hood), Tom (Lacy Hood), Ray Dean (Marla Phillips), Kevin Phillips, Rhonda (Chris Cline), and Addy Phillips; 17 great grandchildren and 18 great- great grandchildren; as well as many nieces, nephews and special friends. Sade was preceded in death by her first husband, Carl Pope; second husband, Buck Phillips; son, Ronnie; daughter in law, Cheryl; brothers, Albert and Glen; and sisters, Thelma Hedgepath and Phyllis Phillips. To send flowers or a remembrance gift to the family of MAE DEAN PHILLIPS, please visit our Tribute Store. "Email Address" would like to share the life celebration of MAE DEAN PHILLIPS. Click on the "link" to go to share a favorite memory or leave a condolence message for the family.